Our researches are conducted in a context of limited marine resources and a strong aquaculture development worldwide. They aim to understand the cellular and molecular mechanisms involved in the control (especially by nutrients) of the main metabolic functions and growth in fish. The research carried out within our group aims to advance our understanding of the nutritional control of autophagy and its role in the regulation of intermediary metabolism in teleost fish. Due to the wide diversity of their lifestyles, metabolic features and phylogenetic position, these species represent relevant model organisms for studying the metabolic role as well as the evolutionary history of such a key function crucial for adaptation and survival. – (i) The rainbow trout (Oncorhynchus mykiss): This species displays unusual metabolic features (i.e., a high dietary amino acid requirement and an apparent inability to use dietary carbohydrate for energy furniture) relevant to gain better understanding of the nutritional regulation and the metabolic role of autophagy. Our current work aims to understand the impact of macronutrient composition of the diets (in particular that of the different amino acids) on the formation of autophagosomes. Persons involved in this project: Sarah SEITE, Nicolas ORY, Karine DIAS, Iban SEILIEZ. Collaborators: S PANSERAT (INRA-UPPA, UMR1419 NuMeA, St Pée-sur-Nivelle) ; N CAMOUGRAND et B SALIN (CNRS, UMR5095 IBGC, Bordeaux). – (ii) The European eel (Anguilla anguilla): A critical stage in the life cycle of eel is the estuarine migration to freshwater rearing habitats by the young stages (glass eels). Glass eels do not feed during this stage and rely exclusively on endogenous energy reserves and the establishment of a tightly controlled energy mobilizing system. Numerous studies over the past decade identified Autophagy (a process of cellular self-eating) as a major energy mobilizing system in metazoans. In this context, the present project aims to determine to what extent the estuarine migratory behavior of glass eel may be linked to autophagy activity and evaluate the impact of temperature as well as the existence of genetic polymorphism in the autophagy-related genes, as an assessment of the evolutionary potential of the European eel in face of environmental changes. Persons involved in this project: Hengtong LIU, Karine DIAS, Iban SEILIEZ. Collaborators: V BOLLIET (INRA-UPPA, UMR1224 ECOBIOP, St Pée-sur-Nivelle). – (iii) the medaka (Oryzias latipes): This species is now recognized as a relevant model organism and extensively used in many areas of biological research. The work we are doing on this species is part of a project aiming to describe the evolutionary history of autophagy in vertebrates in general and in fish more particularly. Persons involved in this project: Laury LESCAT, Karine DIAS, Iban SEILIEZ. Collaborators: J BOBE and A HERPIN (INRA, UR1037 LPGP, Rennes). Knowledge gained through such a research program is of great interest from a comparative animal physiological perspective but provide also an entirely new perspective to the issue of the mechanisms involved in tissues construction, metabolism and homeostasis in fish species of high economic, scientific and ecological value. Figure legend: Primary culture of rainbow trout (Oncorhynchus mykiss) myoblasts were incubated in a serum- and amino acid-deprived medium. 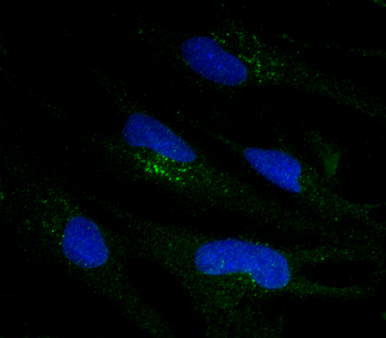 After 4 h incubation, the immunolocalization of LC3B (green) revealed the appearance of punctate LC3 staining that represents autophagosomes. Nuclei were stained with Hoescht (blue). These results demonstrated for the first time in this species the existence and the control of the autophagosomal system (Seiliez et al., 2012 Autophagy, 8 (3), 1-12). 1. Seiliez, I., Belghit, I., Gao, Y., Skiba-Cassy, S., Dias, K., Cluzeaud, M., Rémond, D., Hafnaoui, N., Salin, B., Camougrand, N., Panserat, S. (2016). Looking at the metabolic consequences of the colchicine-based in vivo autophagic flux assay. Autophagy, 12(2):343-56. 2. Belghit, I., Skiba-Cassy, S., Geurden, I., Dias, K., Surget, A., Kaushik, S., Panserat, S., Seiliez, I. (2014). Dietary methionine availability affects the main factors involved in muscle protein turnover in rainbow trout (Oncorhynchus mykiss). British Journal of Nutrition, 112 (4), 493-503. 3. Seiliez, I., Dias, K., Cleveland, B. M. (2014). Contribution of the autophagy-lysosomal and ubiquitin-proteasomal proteolytic systems to total proteolysis in rainbow trout (Oncorhynchus mykiss) myotubes. American Journal of Physiology. Regulatory, Integrative and Comparative Physiology, 307 (11), R1330-R1337. 4. Belghit, I., Panserat, S., Sadoul, B., Dias, K., Skiba-Cassy, S., Seiliez, I. (2013). Macronutrient composition of the diet affects the feeding-mediated down regulation of autophagy in muscle of rainbow trout (O. mykiss). Plos One, 8 (9), 12 p.
5. Seiliez, I., Gabillard, J.-C., Riflade, M., Sadoul, B., Dias, K., Averous, J., Tesseraud, S., Skiba, S., Panserat, S. (2012). Amino acids downregulate the expression of several autophagy-related genes in rainbow trout myoblasts. Autophagy, 8 (3), 1-12. 6. Seiliez, I., Gutierrez, J., Salmerón, C., Skiba-Cassy, S., Chauvin, C., Dias, K., Kaushik, S., Tesseraud, S., Panserat, S. 2010. An in vivo and in vitro assessment of autophagy-related gene expression in muscle of rainbow trout (Oncorhynchus mykiss). Comp Biochem Physiol B Biochem Mol Biol, 157(3):258-66. 7. Seiliez, I., Gabillard, J.C., Skiba-Cassy, S., Garcia-Serrana, D., Gutierrez, J., Kaushik, S., Panserat, S., Tesseraud, S. 2008. An in vivo and in vitro assessment of TOR signalling cascade in rainbow trout (Oncorhynchus mykiss). Am J Physiol – Regul Integr Comp Physiol, 295: R329–R335. 8. Seiliez, I., Panserat, S., Skiba-Cassy, S., Fricot, A., Vachot, C., Kaushik, S., Tesseraud, S. 2008. Feeding status regulates the polyubiquitination step of the ubiquitin proteasome-dependent proteolysis in rainbow trout (Oncorhynchus mykiss) Muscle. J Nutr, 138(3): 487-91.